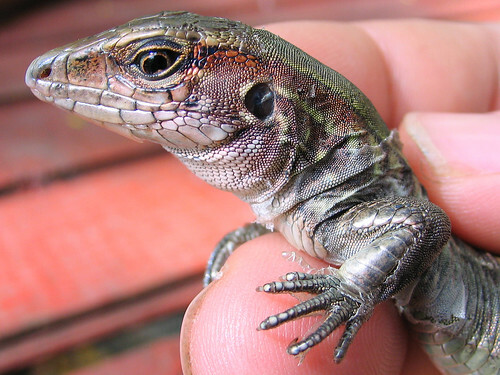 Part of the genus agama and a relative of the water dragons, which is a species of lizard. They are found in high-elevated tropical climates within China, most commonly in the treetops or upon the trunks. Hatchlings are about an inch long and adults reach lengths of eight inches. Because of this, they make great pets. They are also easy to care for because they don\'t require a complicated diet, and they are purely insectivores. The best part, of course, is their great looks. Since Tree Dragons don\'t get that big, adults are 8" long, you don\'t need a huge amount of space for them. A 20-gallon "high" aquarium, 24"x12"x16", would be a suitable enclosure for up to 4 adults, 3 females and 1 male. Four baby to sub-adult Tree Dragons can easily be housed in a 10-gallon aquarium, 20"x10"x12". Though I have heard that multiple males can live in the same cage if the enclosure is big enough and there is enough hiding space, I don\'t recommend housing more than 1 male per cage. Two males have never successfully lived together in any of the reptile species. Other enclosure necessities: It is necessary that you include a lot of artificial plants and other such cover. Without plants and places to hide, your tree dragons will be very stressed out. Stress in any animal can lead to sickness and even death. I\'ve been told, though I don\'t try it myself, that you can house several males in the same cage together so long as you have two requirements; one, you have a large enough cage. Two, you have an ample amount of hiding spaces that it is likely they might never see each other. Don\'t forget tree dragons really enjoy climbing. This means content tree dragons have branches, vines and/or hanging plants. All of these extra accessories will add to the overall display to the enclosure and to the enclosure\'s ability to retain moisture for added humidity. No one substrate is the best, each has its own good qualities and its bad qualities. However, there are some substrates that aren\'t good, some can be downright poisonous to animals both of those categories should be avoided. The substrates that should be avoided are the dry, dusty substrates such as sand and wood chips or shavings. Because the Splendidas require such a high level of humidity they need a substrate that effectively holds water. My personal favorite is cypress mulch; it\'s inexpensive and does a great job at retaining humidity. Unfortunately it could end up being ingested when the dragons hunt their crickets. Tree Dragons enjoy almost room temperature weather, the ideal basking temp is 75°-80° Fahrenheit. The ambient temperature should be from the low to mid 70\'s. To reach these temperatures all you would really need is an ultraviolet (UV) ray light bulb. However, tree dragons don\'t require extreme amounts of UV Rays, only 7% or so. These characteristics make them pretty easy and inexpensive to care for. Splendidas enjoy and thrive in a very humid environment. To meet such needs you would require large water dishes as well as multiple spray bottle mistings per day. Of course, it would certainly help to add natural and/or artificial plants and a layer of moss to the bedding. Not only is it aesthetically pleasing but it also aids in keeping up humidity levels. If you wanted to get real fancy but isn\'t necessary unless your humidity levels aren\'t high enough; you could add a misting system. Fortunately for keepers, Chinese Tree Dragons are purely insectivores. It is a good idea to feed them a variety of prey items such as Live Dubia Roaches or Live Meal Worms that are dusted or "gutloaded" with calcium, because without the calcium supplements they won\'t be getting the proper nutrients. Feed them about 5-8 appropriate-sized mealworms or Live Dubia Roaches (no wider than their mouth) every day. A variety would be (this short list is not all-inclusive) Live Meal Worms, or Live Dubia Roaches, etc. It isn\'t suggested that you feed them wax worms on a regular basis as it can lead to obesity. Splendidas are indeed gorgeous lizards and because they have such simple needs (low UV levels, don\'t need veggies, don\'t need large swimming pools) they are certainly very rewarding. If you follow these care instructions, you and your Japalura Splendida will live a long and healthy life together. Good luck and happy herping!